Have you ever found it challenging to know what specific SAP Cloud Platform services you need and how you need to use them in order to achieve the technical goal you had in mind? If so, this article is for you! We’ve made it easier for you to select, configure and consume platform services, by introducing recipes – sets of guided interactive steps which help you achieve specific goals. You can use recipes for a range of use cases, and they often result in an artifact. This can be anything from an application to content for integration and workflows, or even a document. Documentation-only recipes, which include the technical details needed to follow the recipe, like tutorials or openSAP courses. What does a recipe look like? 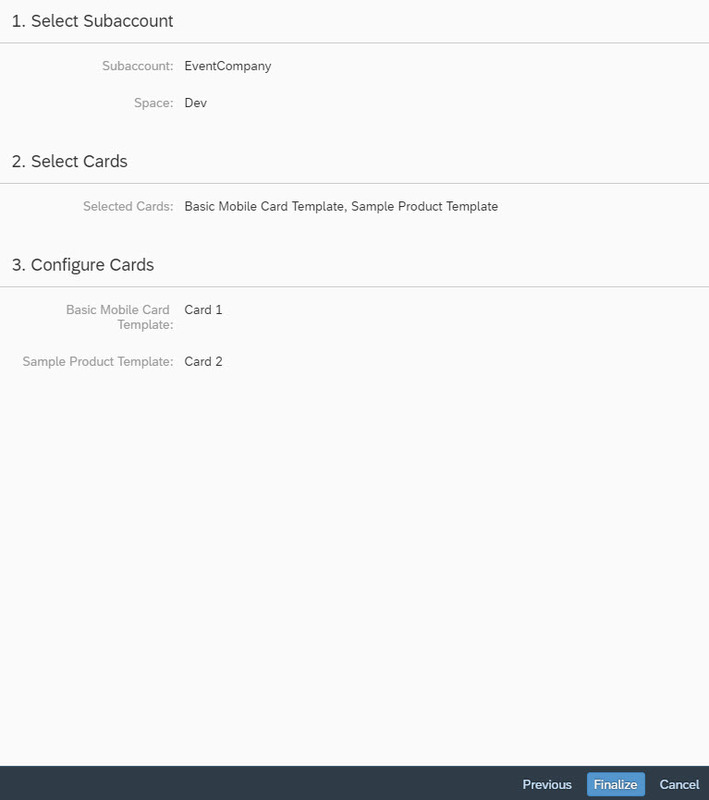 Let’s take the recipe Build Micro App for SAP Mobile Cards as an example. Clicking on its tile will take you to the Overview tab of the recipe, where you can learn more about what this recipe will help you achieve and how. Graphics are also included to make the whole process (and in this case also the outcome) of the recipe clear and easy to digest. Moving on to the Components tab, you will find all the technical components (such as services) which are either mandatory for the recipe to work or which can be used to gain certain functionality. Finally, under Additional Resources you can find sources of information (for instance documentation or tutorials) which can help you further understand the process and components used by the recipe. How do I follow a recipe? The recipe we’ve chosen as our example is an automated recipe – this means you can use a wizard to go through the steps and create your artifact. To launch that wizard, all you have to do is choose Start Recipe from the top right corner. Finally, review your selections and choose Finalize to create the micro app. 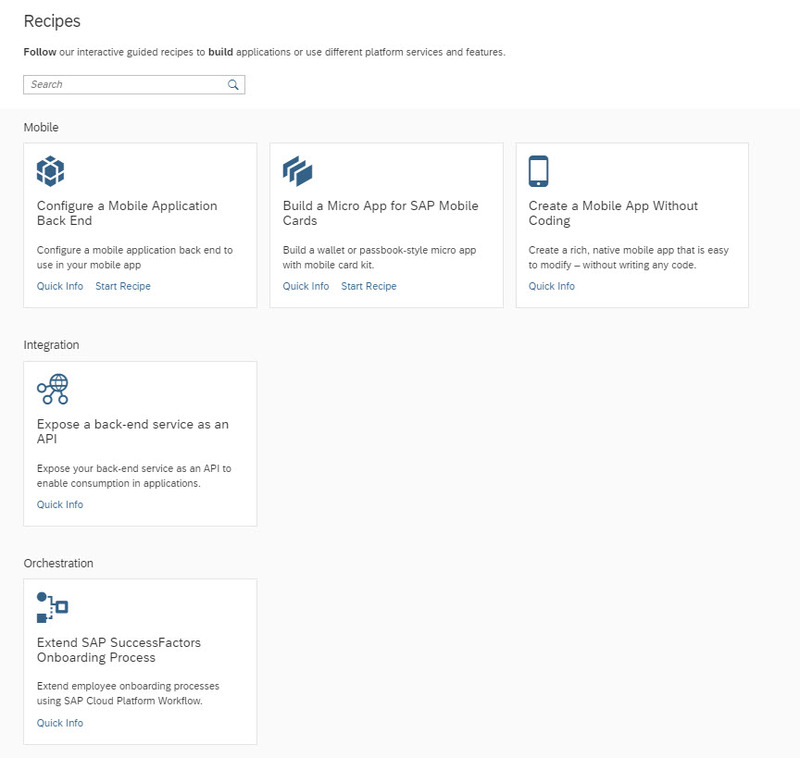 Now that you know all there is to know about the new SAP Cloud Platform recipes, go ahead and try them out! Be sure to provide feedback either through the cockpit or by commenting directly on this blog, so that we can continue to improve your development experience. This looks like a very useful feature. I tried to access the recipes link in my NEO trial cockpit but wasn’t able to find it. Is this on a CF specific feature? Also the link (https://help.sap.com/viewer/page-not-found?url=https:%2F%2Fhelp.sap.com%2Fviewer%2F65de2977205c403bbc107264b8eccf4b%2FCloud%2Fen-US%2Ffb1b56148f834749a2bf51127421610b.html) to the SAP Help Portal page doesn’t work. Thank you for your comment! The blog post was accidentally published a few days earlier and therefore the links to the documentation as well as the recipes are not yet available. This feature will actually be accessible in the cockpit from February 28th (this Thursday). I have updated the post to include this information and have temporarily removed the links to the documentation. I apologize for the confusion and inconvenicence! A small note for those with similar question – as the page mentions this feature is not available in Trial. how would these recipes be different from official documentation or even opensap course where some of the products are showcased and demoed ? thank you again for sharing this information. Recipes are only available starting with the current and future versions of SCP (so from the Feb 28th release onwards). Recipes are active guidance. Some of the recipes also provide an wizard which helps in automating the recipe steps. Recipes are connected both to the overall commercial aspects like products, as well as to the management aspects like accounts and services. Therefore, they can offer capabilities such as checking if you have the required entitlements to use a particular recipe. Recipes help realize a specific, narrow, technical goal. I hope this helps! If you have any further questions do get in touch! Great new feature. Keep going! Could you pl. help here? Apologies for not getting back to you sooner! At the global account level, ensure that the Cloud Foundry subaccount where you want the recipe to run has entitlements for all of the components above. To learn more about adding entitlements to subaccounts, see Add Quotas to Subaccounts. A quantity of 1 for each component is enough to run the recipe. Ensure that the Cloud Foundry space where you want the recipe to run has at least 512 MB of memory and 1 route available, since this will be needed for the application created by the recipe. If you don’t have enough memory or routes, simply add more Application Runtime quota to the subaccount by following the same process in Step 1. Once these steps are complete, run the recipe again. 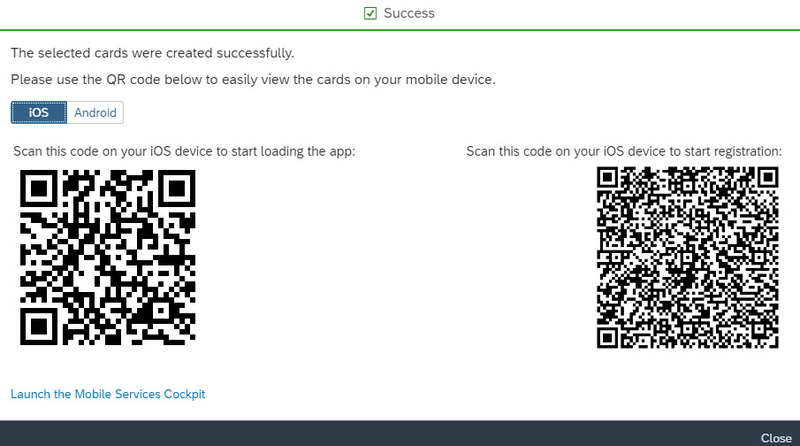 After selecting your Cloud Foundry subaccount and space, you will be asked to initialize your mobile card kit. Click on that button to proceed. After a couple of minutes, the status of Mobile Card Kit should change to Available. Choose Next to proceed to the next step of the wizard. Please note that it may take a few minutes until cards show up on this next step. If you see an error message telling you that the card templates could not be fetched, simply navigate back to the previous step, wait a few minutes and try again – they will eventually appear! I hope this solves your probelm. If you stumble accross any other issues please get in touch, I am more than happy to help!